Can I check the status of the Box service? Yes it is possible to check to see whether there is a problem with the Box service. Just go to Box Status. If it looks like Box isn't reporting issue and you're having a problem please contact the IS Service Desk. Can I upload any kind of data to Box? No. You are not allowed to use Box for data classified as “Protected Information.” You may, however, use Box for data classified as “Sensitive Information.” For a description of these data classifications, please see http://fa.oregonstate.edu/infosec-manual/000-introduction/appendix-data-classification-data-element. Can I upload research data to Box? Box for Oregon State University is now available for the OSU community. We strongly encourage researchers to use this new service, since it provides unlimited, secure, cloud-based data storage that's accessible anytime, anywhere, from any device. Box adds to the OSU universe of sharing and collaboration services, and our community may continue to use Google Drive, Microsoft’s OneDrive, and the on-campus storage solutions provided by IT departments across campus. While your total data storage is unlimited, please note that the maximum size of any individual file is 15 GB. Note: If you are using IE 9, 10, or 11 there is a 4GB upload size limit imposed by the browser. It is prohibited to upload any “Protected Information” to Box, including but not limited to classified research data and research data with export control / ITAR limitations. You are allowed to upload “Sensitive Information,” but you must not share that data with persons not authorized to access such information. We encourage everyone at OSU to review the Security Office’s data classifications at http://fa.oregonstate.edu/infosec-manual/000-introduction/appendix-data-classification-data-element to ensure that we are compliant with the ways that we store and share our data. How can I invite collaborators using a shared link? Inviting other users to be collaborators in a folder requires adding each individual using the invitation dialog. In some cases you may already have a mail list or distribution list that has everyone you wish to invite. Using a shared link is an easy way to invite other users to join a folder as a collaborator. There are several steps to do this that are outlined in this video. Once the invitee receives the email and visits the page they will see something like this. If they are OSU Box members click on the "Log in" link. External users will need to have a Box account and would click on the "Sign up" link. Once signed in the "Join Folder" button will be active and they will be able to join as a folder collaborator. If they do not join as a collaborator they will be limited to downloading and viewing. If you have any questions about how to do something in Box, please contact your IT Support staff. Collaborators can be either an inviter and an invitee. If or when the collaboration is no longer needed either the inviter or the invitee can end the collaboration. The process as described has to be done in the Box web UI. To invite someone to collaborate on a folder you have to have the folder owner, co-owner, or editor role. These same roles can also remove invitees from a collaboration. There are two methods of removing someone that has been invited as a collaborator. Method one: Click on the folder. To the far right of the page you will see a list with the folder owner as well as the people collaborating in the folder. To remove some one, click on the three dots to the right of the person's name and select "Remove" from the drop down menu as shown in the following image. Method two: Click on the three dots to the far right of the folder name. 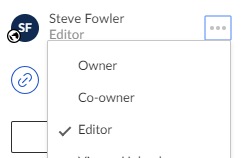 In the drop-down menu click on "Share" and then "Manage Collaborators" as shown in the following image. This will take you to a page that lists all collaborators on that folder. Click on the down arrow next to the user's role and select "Remove" from the menu to remove them from collaboration. If you are a collaborating invitee, but no longer need/want to collaborate, you can remove yourself following the same process as shown in method one. Instead of choosing someone else, click on your name and choose "Remove" in the drop down menu. 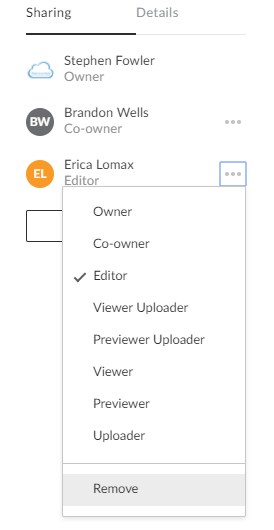 The second method is similar to method two above except that you go to "More Actions" in the drop-down menu and then select "End collaboration" as shown below. A popup dialog will warn you that you will no longer be able to see or collaborate in the folder if you proceed. Click "Ok" complete the process. How do I migrate data from other cloud services? The three most common cloud providers we deal with are Google, OneDrive and DropBox. There are many others and methods may vary depending on the initial cloud provider. Please review the FAQ on What kind of files does Box Sync ignore. Before beginning this process it may be beneficial to take some time and decide whether all the content you intend to move is needed and whether it is organized in a way you want to have it in the new location. Deleting content now will shorten the relocation process and having it organized appropriately will aid in finding and sharing content out of Box. Unzip the file and begin uploading the files to Box. An alternate method is to drag files from your local Google drive to your local system folder or to your Box Sync folder. Native Google docs have a .gdoc, gsheet or gslides extensions. Box Sync will not upload these extensions to Box. Other file types such as Office documents, PDF and image files can be done this way. Open your OneDrive for Business folder, which defaults to a folder under your user profile on your local system. Upload files and folders using the Box web uploader, or copy or drag files and folders to your Box Sync folder. Open your DropBox folder, which defaults to a folder under your user profile on your local system. How do I migrate data into Box? When migrating data to Box it is important to understand your options and the ramifications of each option. Before beginning, take some time and decide whether all the content you intend to move is needed and whether it is organized in a way you want to have it in the new location. Deleting content now will shorten the relocation process and having it organized appropriately will aid in finding and sharing content out of Box. Before you begin make sure you review the important information at the end of this FAQ. The following is Box’s recommended methods broken out by data quantity. 500 GB or more: Contact the IS Service Desk. Drag & Drop: You can move files between your local system and your Box account by dragging them onto your Box account open in a web browser. Folder Upload: Open your Box account in a web browser. 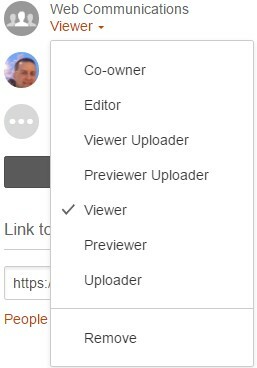 In the upper right hand corner is a button labeled “Upload”. Click on that button and select Folder. This will open a dialog box which will allow you to select a folder you wish to upload to your Box account. Once you select the folder click OK and the process begins. FTP: FTP provides a convenient method of uploading large amounts of data at one time. To get started you will need to setup an external password (See FAQ on "How do I set or change an external password?") and download, install and setup an FTP client on your local system (See FAQ "How do I setup FTP over SSL for migrating data to Box?"). Note: SFTP is a different protocol and does not work with Box. Box Shuttle: Box has been helping large companies move extensive amounts of data from on premise to Box storage for a number of years. Box Shuttle combines software migration tools along with expertise from Box Consulting to help customers move data into Box. This is a consulting service that is not covered by OSU’s contract with Box. Groups or departments that are interested in exploring this option are encouraged to contact the IS Service Desk for more details. Here are some things to consider when preparing your files for migration. Note: These are recommendations to keep Box running at peak performance, not hard and fast product limits. Do not point multiple sync clients at the same folder. For example don’t have a folder that is being managed by Box Sync and DropBox sync or Box Sync and OneDrive sync client. No single folder should contain more than 15,000 files. For the best performance, have at most 10,000 files in one folder. Folder names shouldn't be longer than 100 characters. File paths shouldn't be longer than 255 characters. No two folders within the same parent can have the same name. For example, the “Magical Creatures” folder can have only one “Unicorn” folder. Certain characters are not allowed in Box file or folder names. You must first remove all special characters from names for content you wish to migrate. How do I set or change an External Password? In most cases you will use OSU's SSO login to access your content in Box, however there are some applications that cannot use SSO. FTP(TLS) and WebDAV are prime examples of applications that cannot use SSO. To use the you must sent an external password. Please see "What are the External Password requirements" before proceeding. Open https://box.com/reset in your favorite browser. Enter your ONID email address and press "Reset Password". An email will be sent to your OSU email address. Check your email and click on the "Reset Password" link in the email. Enter your new password in the fields provided and press "Reset Password". Open a browser and login to your Box account using SSO (your ONID username and password). Click on your account profile and select "Account settings"
Go to the Account heading and scroll down to Authentication. Enter your current password and the new password in the appropriate fields and click "Save". Note: If you need to reset your ONID password for your SSO login, go to the Change Password page. How do I set up an institutional or organizational folder? The following two options will walk you through setting up an institutional/organizational folder using a new folder and an existing folder. Only folders that have OSU Folder Admin as the owner can be considered an institutional/organizational folder as this account is not tied to an individual user and is not subject to being deleted when a user leaves OSU and is no longer eligible for an OSU Box account. **If you have an institutional/organizational folder that needs to be reverted back to a personally owned folder please skip to the bottom of this FAQ. You are creating a new folder that you would like to make an institutional/organizational folder. If you're creating a new folder click the "New" button, then select "Folder". This will pop up a new folder dialog. In the folder name box put your folder name,and in the invite box put the name of one person to be the co-owner and the OSU Folder Admin. For the access type or permissions select co-owner for these accounts. Click Okay or Create. Select the folder you've just created. On the right you will see yourself and the two collaborator co-owners. Make the OSU Folder Admin the owner, by clicking on the permission setting (old UI) or on the three dots to the right of the name (new UI), and select Owner. Click Okay on the “Change Item owner” dialog that pops up. This is just a reminder that your permissions will revert to Editor on this folder. If you wish to be a co-owner have the other co-owner change your permissions from editor to co-owner. Here is a short video that also walks you through the process. You have a folder that you would like to convert into an institutional/organizational folder. You must be the folder owner. No one except the folder owner can transfer ownership to another OSU Box account. Transferring ownership of a sub-folder will affect collaboration. Collaborators assigned to the parent folder will lose access. Those assigned to this folder or to a child folder will retain access. When you transfer ownership of a sub-folder or child folder it will move from the parent folder to the All Files area of your Box account. 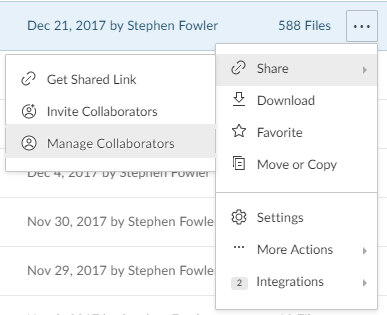 Click on the box with the three dots to the right of the folder name and select "Share" or Sharing" and then "Invite Collaborators". In the invite dialog box invite the OSU Folder Admin plus one other person. Make sure you have at least one other co-owner on this folder. Once you transfer ownership your access permissions will be downgraded to Editor and only another co-owner can reinstate you as a co-owner. Select Co-owner as the permissions for both these accounts, and click on Send Invites. The OSU Folder Admin will auto accept the invite. Re-select the target folder. On the right you will see yourself and the two collaborator co-owners. In the event you have difficulty completing either of these two options please submit a request to the IS Service Desk. Make sure you chose BOX for the category. Co-owners will act as the folder administrators and can set permissions and properties on the folder and subfolders. Two users are needed in the event one person is not available and in the event one of the two people leave OSU. Yes you can have more than two co-owners. Any co-owner can designate other co-owners at any level within the folder structure. What should I know as a co-owner? As a co-owner, you need to review the following information to properly manage the folder. A collaborator is anyone at or external to OSU that you granted access. Box uses strict water fall permissions. Any access/permissions to a given folder means that same level of access/permissions is granted to all sub-folders and files. I need to revert an institutional/orgnaizational folder. There are many reasons you might want to do this. In the event you find you need to do this please submit a request to the IS Service Desk. If the folder has two or more co-owners we will want to have concurance from them before reverting the folder. Transferring folder ownership in Box. You are graduating, or you have accepted a job outside OSU, or you changed departments within OSU, or you are retiring, and you need to change the ownership of some folders in your Box account. How do you do this? Important: You have to be the owner of the folder you wish to transfer. You cannot transfer ownership of a folder you do not own. How do you tell? Open your Box account in a web browser. To tell if you are the owner click on the folder then look to the far right of the page and it will show if you are the owner or if someone else owns the folder as in the following image. If you are the owner and have no collaborators (manila folder) you must first invite the intended owner to be a collaborator on the folder. Once they have accepted you will be able to transfer ownership by clicking on the three dots just after their name, as in the previous image. In the pop-up menu simply select the Owner item. When you do, a dialog will be presented warning that if you proceed you will no longer be the owner and will be down graded to editor permissions. Click “Okay” and the folder ownership will be changed. If it is a large folder with lots of files you may also get a notification that it may take awhile for the transfer to be completed. If you are the owner and have other collaborators simply pick the person from the list of users that you wish to transfer ownership to and make them the owner as described above. Don't worry, the other people that are collaborators will remain collaborators after ownership has changed. Folder ownership is transferred how do I remove myself? In the same way that you transferred ownership you can also remove your account from participation in that folder. As you did in transferring ownership click on the three dots to the right of your name. At the bottom of that menu is the “Remove” item. Click on that and you will be removed from collaboration on that folder. How to setup FTP over SSL for migrating data to Box? The following instructions are for Windows, Mac, or Linux using FTP. Linux instructions for lftp are here. Box recommends using FTP to migrate data to Box if you are uploading a large amount of files, but moving less that 500GB of data total. Setup an external password on your Box profile. FTP cannot use OSU single sign-on (SSO) process. See FAQ on "How to set or change an External password." To connect to Box's FTP server you will need an FTP client of your choosing (Filezilla, Cyberduck, SmartFTP, etc). Open your FTP client and enter the following information in the appropriate areas. Port: 990 for implicit encrypted connection (FTPS), or 21 for explicit encrypted connection (FTPES). FTP is designed to be used for initial bulk uploading and occasional bulk downloading of files from your account and is a great option if you need to do a one-time migration of data into Box. If using WinSCP, use version 5.9.x or higher. FTP unencrypted (port 21) is disabled on OSU's Box instance. FTPS implicit (port 990) and FTPES explicit (port 21) are available over passive FTP. Active FTP and SFTP are not supported. Resuming an upload/download: The commands, REST (restart) and APPE (append) are not supported. This means that we do not support resumable uploads/downloads on Box for FTP. Any failed upload or download needs to be retried. FTP is not recommend or supported as a primary access method, or as a 2-way sync mechanism Box sync is the recommended tool for that. Is Box a backup solution? Box is a great cloud storage, collaboration, and content management application. Rather than maintaining all your documents on your local hard drive create, save and store them in Box. You can sync active work to your local system and keep the rest in Box. The advantage is that Box handles all the backup, version control, and security for your files. Should you prefer to keep your files and documents local, Box is also a great place to backup and store them. Before thinking you can back up your entire hard drive or a complete image of your hard drive keep in mind that the largest file size you can upload is 15GB. Also, the applications listed below aren't designed to save your computer's system state, which is something you would need to do a complete backup of your computer. NOTE: You should avoid is pointing more than one backup or sync application at the same folder or folders. This can cause conflicts with your file and folder contents. An example of this would be having both Box Sync and Google drive sync accessing the same folder on your local drive. What are some of your options for using Box as a backup location for your important data? Note: It is possible, though not officially supported, to redirect your “My Documents” folder to your Box Sync folder. It is also possible to change the location of your Box Sync folder on your local hard drive. Please work with your local DCA or IT Support staff if you would like to try this configuration. Box Sync has clients for Windows and Mac. The following applications will work with Box and are published in Box’s app store. These applications are not officially supported by OSU. Please check with your IT Support organization or DCA before installing or purchasing. Allway Sync will allow you to sync files and folders unidirectionally (local to Box or Box to local) or bidirectionally between Box and your local drive. You can setup to sync multiple folder and you can set up multiple jobs to sync to other locations besides Box. Allway Sync also works with other cloud vendors as well as other protocols such as FTPS, SSH and others. List of other features. Note: The terms a license agreement does not permit the use of the free version for use at OSU by employees or persons acting in the role of employee at OSU. Students of OSU may use the free version as long their use does not involve for-profit activity. End User License Agreement. SynBackPro will allow you to sync files and folders unidirectionally (local to Box or Box to local) or bidirectionally between Box and your local drive. You can setup to sync multiple folder and you can set up multiple profiles to sync to other locations besides Box. SyncBackPro also works with other cloud vendors as well as other protocols such as FTPS, SSH and others. List of other features. Note: 2BrightSparks does provide a freeware edition, SyncBackFree, however it does not work natively with Box or any other cloud provider and the FTP protocol is limited to FTP only which is not permitted on OSU’s Box instance. Please see the List of Features if you’re curious about what is provided with the free version. SyncBackPro is Windows only but 2BrightSparks has the SyncBackTouch application that works in concert with SynBackPro to allow you to backup Mac and Android devices. Syncovery will allow you to sync files and folders unidirectionally (local to Box or Box to local) or bidirectionally between Box and your local drive. You can setup to sync multiple folder and you can set up multiple profiles to sync to other locations besides Box. Syncovery also works with other cloud vendors as well as other protocols such as FTPS, SSH and others. List of other features. Note: Syncovery does not provide a free version of their application. There is a 30-day trial edition available to allow you to trial the software. Syncovery does provide native applications for Windows, Mac and Linux clients. ExpanDrive works a bit differently than the previous products in that it creates a virtual USB drive on your local system. It is intended to work as if it is a local drive where you would save your files or you could use it as a backup target for your backup application. All files in ExpanDrive are saved or uploaded to Box. When you access a file, it is quickly downloaded for you to work on and then saved back to Box when you save them. Box handles versioning and the backup of your data on Box. More information and features. Note: ExpanDrive provides a time limited trial version. It does require a separate application to schedule and handle backups from other folders on your local system. It is available for Windows and Mac clients. The following software is not published on Box’s app store and is provided for informational purposes only. Use them at your own risk. MacDropAny is a Mac only application that lets you sync any folder on your Mac with the cloud, for free. It does this by creating a symbolic link between the folder on your local system and your local cloud folder, in this case Box Sync. Any file you have or add to your local folder is then uploaded to your Box account. Note: MacDropAny is a free application that does not appear to be in active development. Controlling the sync of any folder setup under MacDropAny must be done in the Box web UI. Box Sync has published what files types that it will ignore or block. For detailed information please visit OSU’s Box FAQs. FTPBox is not associated with Box. It is primarily a FTP protocol app that has an active sync feature. You can set the source and the target folder with the target folder being a folder in your Box account. Note: FTPBox is a free application that does not appear to be in active development. The use of FTP requires that you use FTPS (either explicit or implicit SSL) which requires setting up an external password in your Box account. For the how-to on setting up an external password please visit OSU’s Box FAQs. You are limited to one source and one target folder, but the source folder may contain any number of subfolders or files. Is Box replacing other services? What makes it different? Box adds to the OSU universe of sharing and collaboration services, and our community may continue to use Google Drive, Microsoft’s OneDrive, and the on-campus storage solutions provided by IT departments across campus. Unlike the Google environment, Box allows for department-level file ownership in addition to individual-level ownership. Box adheres to the highest industry standards for security so you can share, access, and manage your content with confidence. Secure data centers: Your content is stored on enterprise-grade servers that undergo regular audits and are monitored 24/7. While Box is a global storage provider OSU's contract with Box guarantees that all OSU's data will be housed within the United States. All files uploaded to Box are encrypted at rest using 256-bit AES encryption. For files in transit, AES 256 is a supported cipher, however we default to use RC4-128 encryption. We do this to mitigate a known vulnerability in SSL called the BEAST attack, which an attacker could use to hijack someone's web session when other ciphers (including AES 256) are used. 128 bit encryption is currently considered safe and secure. AD/LDAP integration: Enterprise edition customers can replace Box’s authentication mechanism with their own. OSU uses your ONID credentials when authenticating to Box using SAML SSO. This ensures that your username and password combination does not leave OSU when you log in to Box. Box is also SAS70 Type II and Safe Harbor certified. Box’s corporate network and datacenters are continually tested in accordance with SSAE 16 Type II standards, and we carry regularly updated third-party SOC1 and SOC2 certifications of our compliance. We maintain our own SSAE 16 Type II certification and audits for our corporate operations and platform. While Box's facilities and methods ensure your data is secure you can only use it to store data sensitive and below in accordance with OSU's InfoSec Policy. For additional guidance, please review the OSU Security Office’s policies on User and Personal Information Security. When sharing or collaborating with others take care to share your data appropriately. Never share “Sensitive Information” with persons not authorized to access such information. Head over to "https://developer.box.com/" and setup a developer account. Click on Login and use your OSU Box account using the SSO login. Now that you have an account take some time and review the developer docs "https://developer.box.com/docs" and API documentation "https://developer.box.com/reference" paying particular attention to the section on OAuth 2 authentication. Select your SDK to develop your app with "https://developer.box.com/page/sdks"
When you are ready to begin testing find the Client ID under the OAuth 2.0 Credentials section of the app configuration. Just below that is the Application Scopes section where you need to uncheck all the boxes except the "Read and write all files and folders stored in Box". Finally, visit the OSU Support Requests site and submit a support request to have the Client ID from the previous step added to the list of Authorized Apps. In addition to the Box SDKs are the Box UI elements "https://developer.box.com/docs/box-ui-elements" that are pre-built UI components that allow developers to add elements of the main Box web application into their own applications. Box apps are applications that enable you to connect to your Box account from within a third party vendor’s account or open/create content in Box using a third party vendor’s application. Vendors work with Box to have their app listed in Box’s App store which you can access by going to https://oregonstate.app.box.com/apps or clicking on the Apps link in your profile menu. These “published” applications are enabled by default as they have completed an application process with Box. Applications that have not completed the application process and are not listed in Box’s app store are “unpublished” applications. Unpublished applications may also be applications written by you or someone else using Box’s API. Unpublished applications are disabled by default in OSU’s Box instance. Please see OSU's Box Approved Apps page. How do I add an app to my account? Published apps can be added by clicking on the “+Add” button on the app’s description page. That will install and enable that app on your Box account. Unpublished apps have to be individually permitted in order to work on OSU’s Box instance. To do that the developer has to provide the client_id or API for the application. These are available to the application developer in the application settings in their Box Developers account. Until they are provided the application will not work. Submit a support request along with the above information to IS Support to have an unpublished app enabled. The published app isn’t working, now what? Not all published apps use or are compatible with OSU’s SSO process. In those instances you will need to set an external password. (Please see how to set an external password and external password requirements on OSU’s Box FAQ page). Examples of apps that are not compatible are FTP and WebDAV. If the app is said to be compatible with SSO or OAuth then it may be that the developer has not set up the application completely. In that case it may be necessary to manually publish the client_id or API from the app. The developer will need to provide this in order for us to enable the app. How do I get support for Box Apps? Name of the application if different from #1. Application support/Documentation (link or attachment). List of steps you tried along with any steps the application support team had you attempt along with any screenshots of the issue (optional). Please include any information the application's support team wishes to relay to us. Tell us what OS you use. If the app is used with a browser, what browser you were using at the time and if you tried any other browsers. POC and/or support request number for the application vendor. I noticed that the app has a fee associated with it. Many apps require that you have an account with the vendor or that you license their app to use it. Unless the app is provided as a part of OSU’s Box service or another service then any costs must be paid by your department or unit. Are third party apps secure? The contract that OSU has with box about security, privacy, export policy, and storage location does not cover these applications. You need to be circumspect in using Box apps if there is any concern with respect to your data in these area. After all, you are responsible for your data. What are file/folder permissions and how do they affect collaborators? What are Box permissions for collaborators? 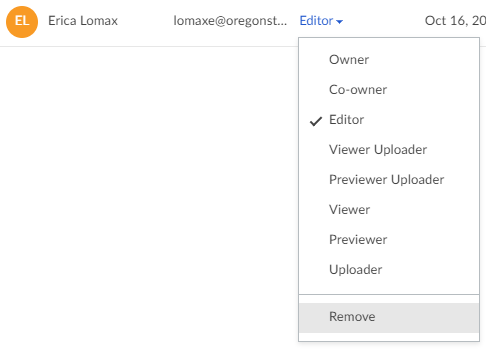 Box allows you to set fine grained control (permissions) over what collaborators can do with the files and folders that you share/collaborate on. For instance, you may want to allow some people to edit the files while others you only want to be able to view the content and still others you want to allow them sync files but others have to access files on-line. Note: As of March 2018 you can now invite collaborators to collaborate on a single file. 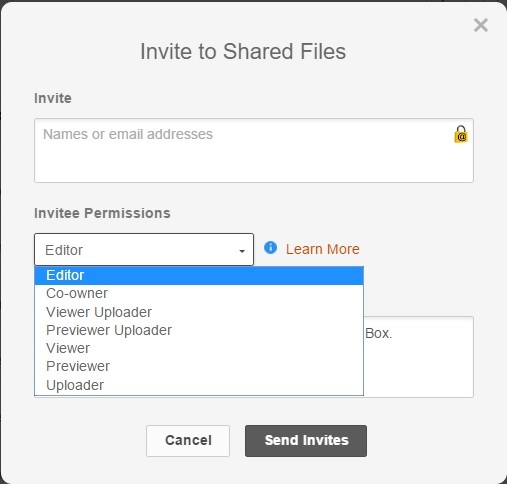 File collaboration permissions are limited to editor or viewer. Permissions can be set or adjusted at any point in time. Typically, you would set the intended permissions when you first invite users to collaborate. If you find later that you need to give a user or users more permission or remove permissions, you can do that by adjusting their permission level. To begin, here is how you set permissions when you first invite someone to collaborate. Once you’ve selected to invite collaborators you will see the following dialog open. Under “Invitee Permissions” you can select one of seven different permission levels for the person or people you have listed in the “Invite” area above. If you forget what each level can do, simply click on the "i" icon next to “Learn More” and you will see an abbreviated list of what each permission level can do. One question we get is why someone can't sync a particular folder. For the answer to that and more information about the full range of collaborator permissions please see, What are the different access levels for collaborators. To change permissions after the fact you simply click on the folder on which you intend to make the change. On the right side of the page you will see a list of users that you are collaborating with on that folder. 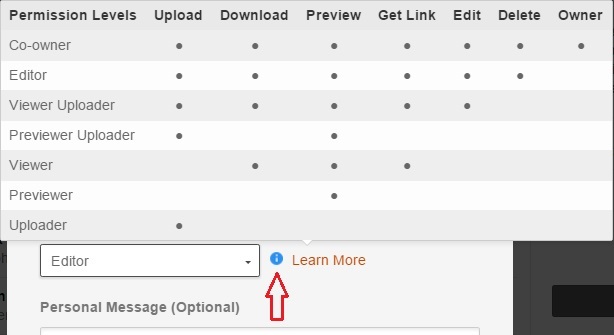 Click on the permission level, if you’re in the old UI, and select the new permission level from the drop-down menu or in the new UI click on the three “…” to the right of the user’s name. Are there any other settings I should know about? Yes, there are additional permission settings you can make in the folder settings/properties area that affect what collaborators can or cannot do. Only folder owners and co-owners can send collaborator invites. This will override the ability of users with editor and below permission to invite other collaborators. https://box.oregonstate.edu/admin/dashboard Restrict collaboration to within Oregon State University. This will make sure that only OSU members can be invited to collaborate on a folder. This is a handy setting if you don’t want external people given access to a folder and subfolders. Hide Collaborators. If set, only owners and co-owners can see who else is collaborating on a folder. Allow anyone who can access this folder from a shared link to join as a collaborator. 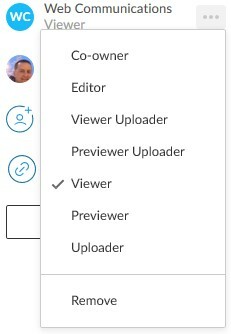 Checking this setting gives users with the link the option of joining the folder as a collaborator with either Editor or Viewer permissions depending on what you have selected. This setting works in conjunction with the shared link access type settings of “People with the link”, “People in your company”, and “People in this folder”. Only collaborators can access this folder via shared links. If checked, only users who are already collaborators in the folder will be able to access it via shared links. This setting will override #4 above. What are the best uses for each data storage service provided by OSU? The following table will help you match your need to the service. Collaboratively create, edit and share Google files with other Google users. Unlimited storage. Used for complex sites and large, long-term project management. Includes the dashboard and tools. 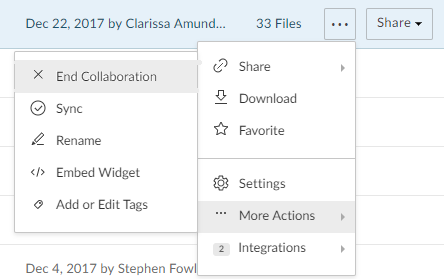 Collaboratively share individual, group, or departmental files with other Box users. Easily retain departmental ownership of files. Unlimited storage. Only option for storing Protected data (data types defined). Collaborate on class projects and use for other instructional uses - graded or not. (data types defined) Hosted off campus, data is encrypted in transit and at rest. Approved for up through Sensitive data only. Hosted off campus, data is encrypted in transit and at rest. Approved for up through Sensitive data only. Hosted off campus, data is encrypted in transit and at rest. Approved for up through Sensitive data only. Hosted on campus, approved for up through Protected data. Data is backed up and able to be restored from the previous 6 months. Hosted off campus, data is encrypted in transit and at rest. Approved for up through Sensitive data only. What are the External Password requirements? What file types does Box Sync block or ignore? Box Sync will not sync files that it ignores or blocks. Ignored files are files that are invisible in Windows Explorer or Finder, such as temporary or system files. Blocked files are file types that Box Sync does not recognize. System and hidden files (hidden folders are synced but hidden files are not synced: such as ._dstore, desktop.ini, thumbs.db). Web based documents (such as .gdoc, .gsheet, and bookmarks) will not sync to the Box Sync folder. Box Notes will be synced to the Box Sync folder, and will open in your browser. These file types can be stored in Box through the Box website, but Box Sync will not recognize them. They will not be synced even if they are in a synced folder. Box Sync will sync folder names ending in a dot (". "), but users on Windows computers will not be able to access the folder. Users will see an error dialog "Location is not available". Please remove the dot "." from the end of the folder name, or Windows users will be required to access the folder only from the Box web site. Due to the saving behavior of Microsoft Access, it's extremely likely that Box Sync will create duplicate copies of .accdb and .mdb files if multiple users are syncing the same file from Box. Box does not recommend having multiple users sync the same .accdb or .mdb file.